The Empire Air Training Scheme was an agreement between Britain and its Dominion countries that trained ab-initio aircrew and put them into a joint ‘pool’ from which they could be drawn to serve with various RAF units. 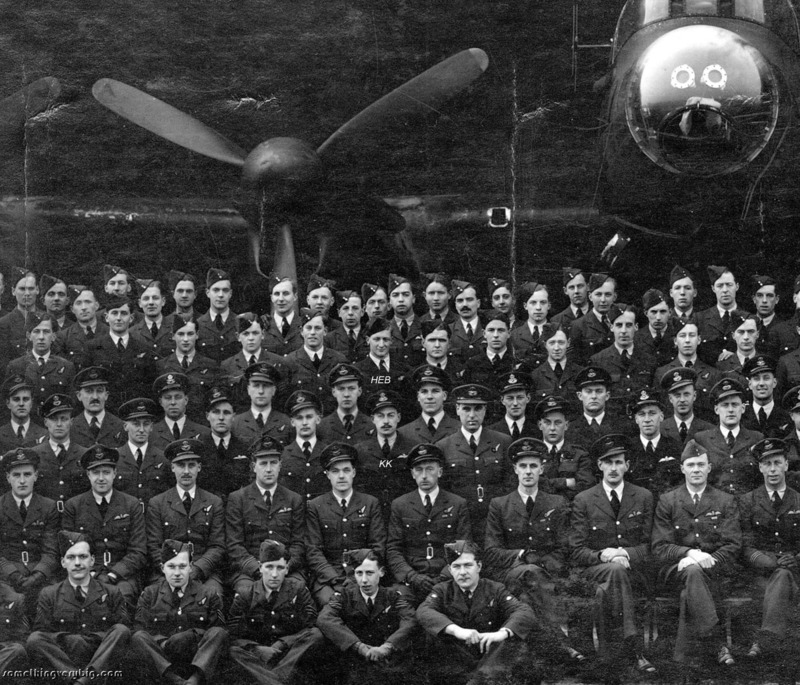 Some 37,000 Australian aircrew were trained under the agreement, serving in Coastal, Fighter and Bomber Commands. And I recently had lunch with almost 40 of them. It was a throw-away line, really. I was referring to my habit of coming away from Bomber Command-related events with a few new contacts, addresses and things to follow up on. But the line obviously tickled the fancy of Fay McPherson. While we were organising my visit to her husband Gerald a couple of months ago, she mentioned that she and Gerald are involved in running the biannual Empire Air Training Scheme luncheon. Fay told me that a lunch is held in Caulfield, Melbourne, every six months for trainees and staff of the Empire Air Training Scheme. In other words, just about any member of Commonwealth aircrew from WWII can attend. Would I like to go along too, she enquired? I had no idea that such a group existed. I’ve been pretty happy with groups of ten or so veterans from various lunches and events, and we might reach 40 on a good year for the Bomber Command Commemorative Day in Canberra, but the old blokes are usually well and truly outnumbered by family, friends and assorted hangers-on like, well, me. But I felt quite special to be invited to this one: fully two-thirds of those present had served in the Royal Australian Air Force in some capacity during WWII. Such a concentration of veterans I haven’t seen in a long, long time. 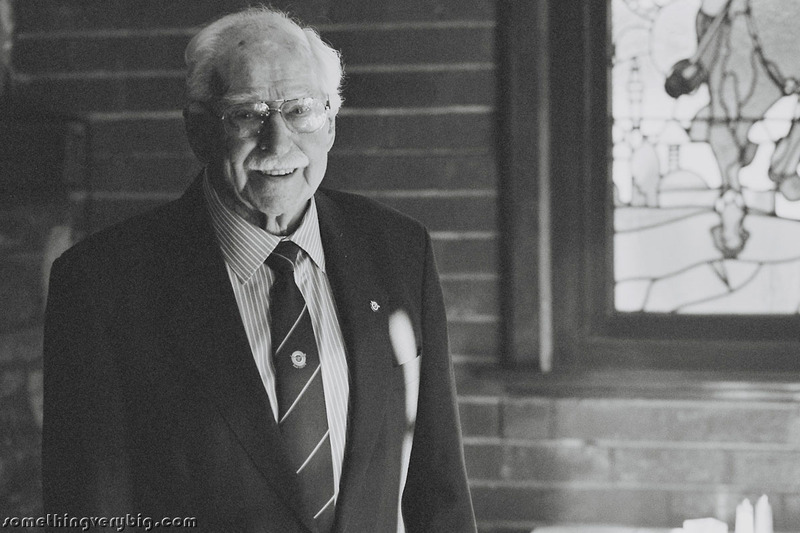 And so it was that, a few weeks ago, almost sixty people descended on the Caulfield RSL. As it turns out the RSL isn’t even in Caulfield. It’s housed in a handsome 90-ish-year-old mock Tudor building in neighbouring Elsternwick, and when I turned up last week people were already starting to gather in the bar, where the staff had set up jugs of beer with glasses for a very civilised serve-it-yourself opener. I recognised one or two people but decided I’d go introduce myself to someone new. The RSL had decided on this, of all days, to renovate its kitchen, so the meal was a somewhat slap-up affair cooked mostly on a BBQ. But it was hearty enough and the conversation was great. I’d asked to be seated next to “someone interesting”, and Fay more than delivered. At my table were two Halifax skippers (Laurie Larmer of 51 Sqn and Ralph White of 192 Sqn) and a Mosquito navigator (Ken Munro). One of the others at the table was Geoff Clark, who while not a veteran himself was pretty close: he’d completed his National Service in the RAF in the 1950s, working in the Photographic Section with reconnaissance cameras. And the other person was a man named Ian Stevenson, who’d brought along a logbook belonging to his uncle who had been a Spitfire pilot killed over Italy. So we all had plenty to talk about, and even more so when I discovered that Laurie lives just two suburbs over from me. I wandered around to some of the other tables between lunch and dessert. Someone mentioned the primitive conditions when the Initial Training School at Somers first opened. Apparently it was quite cold and the buildings were very draughty. At this point I heard Ken Wilkinson, a 77 Sqn Kittyhawk pilot, snort. “I was there in July…” he said. Ken thought at first that, as my interest is mainly Bomber Command, he wouldn’t be of much use to me, and pointed me to the two 460 Squadron men across the table. But then he said he had also done some air traffic control while in the Air Force… I’ll be seeing Mr Wilkinson again for a deeper chat, methinks! 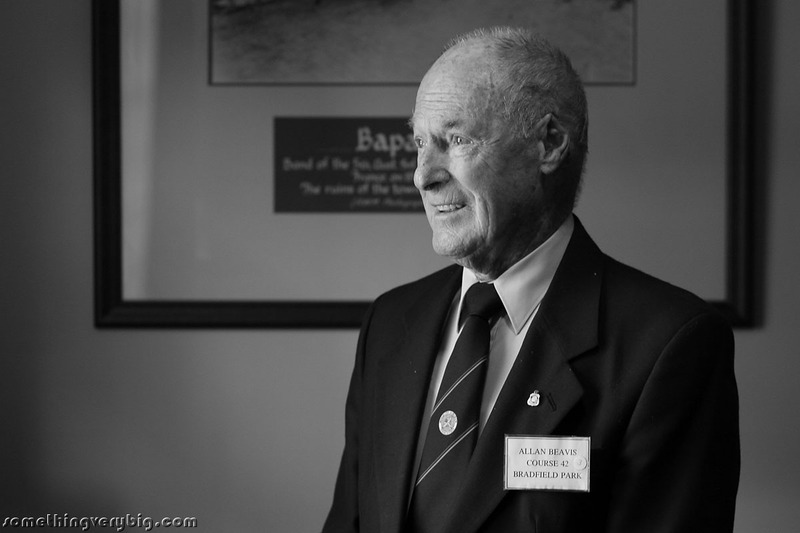 Ken Wilkinson – a 77 Sqn Wirraway pilot – calls a taxi to go home after the lunch. Which, I thought, is very true. I go to a lot of these sort of functions (indeed I’m madly trying to get this post finished in time before heading to Canberra for a whole weekend of them) and, while they are an excellent way to meet people initially, they are not usually the right sort of environment for a detailed talk. If the old blokes are up for something like that, as Jack said, you really do need to go and visit them. So six old men will shortly get a letter from me requesting just such a visit. And hopefully I’ll get the chance to go and get some stories from them. April 25, 2008 was one of the first years that I joined the 463-467 Squadrons Association for the Sydney Anzac Day March. It was, as I remember it, quite wet. There were a good few more veterans marching then than there have been in more recent times – I guess age catches up quickly for most people sometime between their late 80s and early 90s. And so that wet April morning seven years ago, back when the old blokes weren’t quite so old, the march was moving a little quicker than it now does. One veteran, though, was falling slightly behind, so I dropped back to offer him the shelter of my umbrella. We chatted as we marched. His name was Harry, he said, and “I was doing ok until I lost my marbles a few years ago!” I had to admit he looked in pretty good shape to me, notwithstanding the ever-increasing distance between us and the main group of marchers ahead. Harry (on the right), before the marchers got away from him. 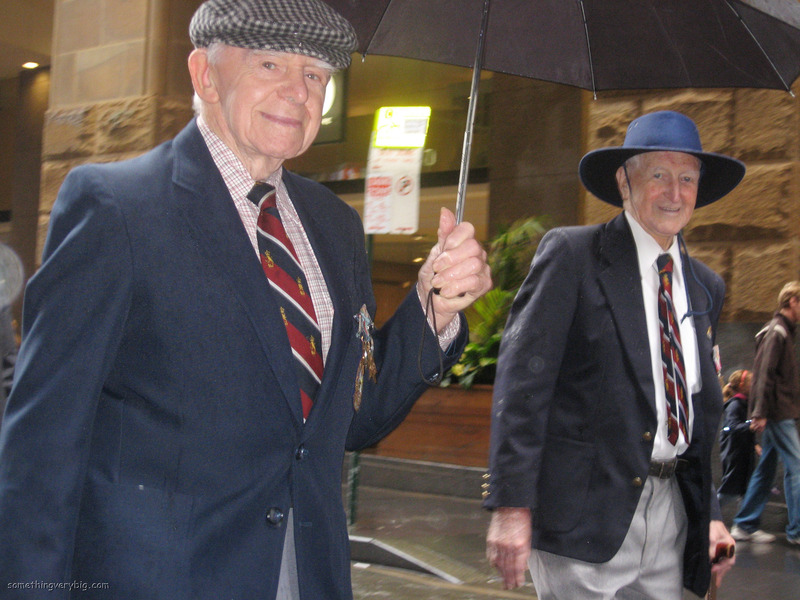 Anzac Day 2008., Sydney. 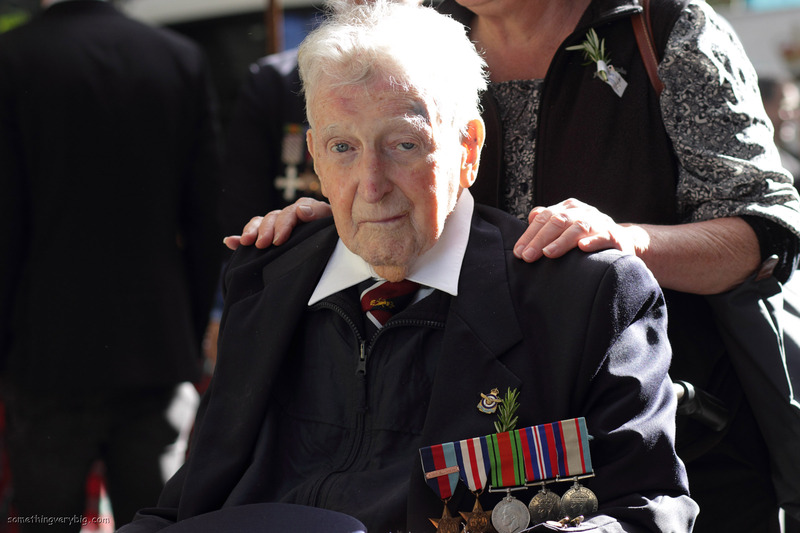 The other veteran is David Walter, a 467 Squadron W/Op, who died a few years ago. But Harry, determined to complete the march on his own two feet, had a plan for that. Just after the Sydney Town Hall, the traditional march route passes St Andrews Cathedral and then turns left into Bathurst St. We watched the Squadron wheel left in something that may have once resembled parade ground style (it had been over sixty years for these blokes, after all). Cheekily, though, my new friend Harry led me and my umbrella not so much around the corner as across it, cutting the corner and neatly closing the gap (at least a little bit). No problems with marbles there, then, lost or otherwise. 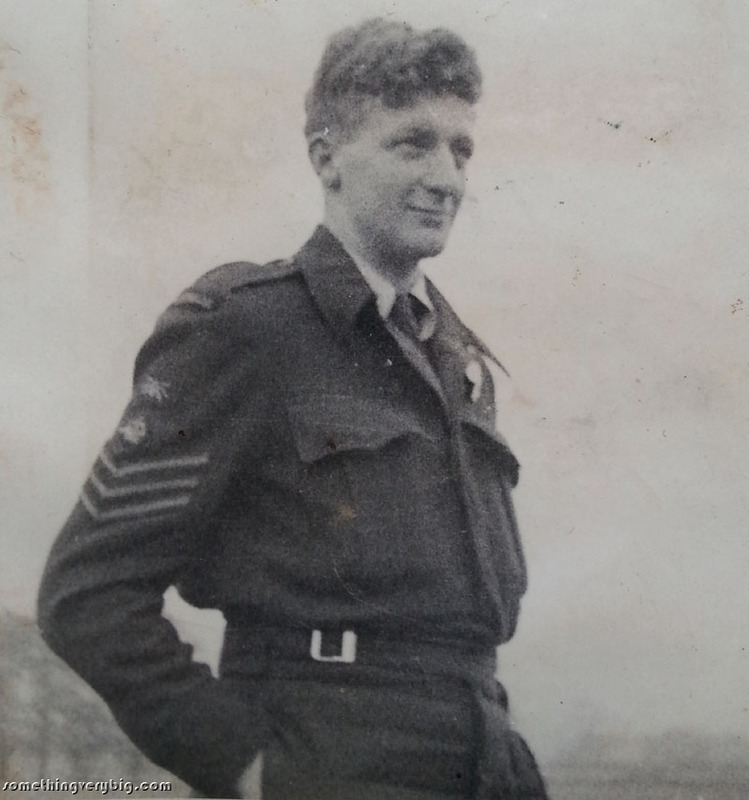 This happy memory came to mind recently when I learned that Harry – actually Henry Emanuel Brown – 106 Squadron Wireless Operator, died peacefully in hospital on a Sunday night in May. 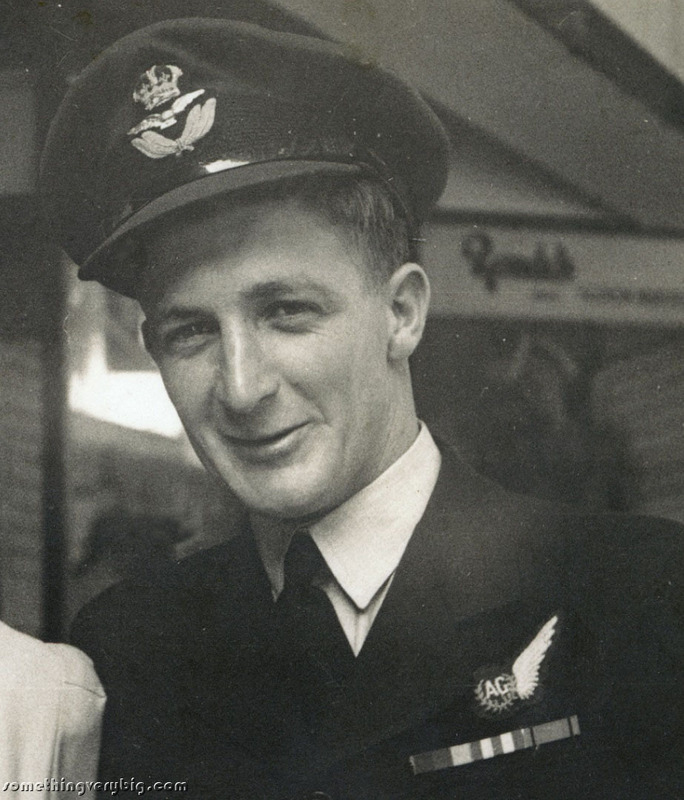 Harry had completed a year at Teachers College training to be a science teacher (having not yet reached the age of seventeen years) when he enlisted in the Royal Australian Air Force, using his brother’s birthday to try and sneak in four months underage. Alas, his family tell me, the duty sergeant knew him and ‘misplaced’ the paperwork until after Harry’s actual birthday. He was called up in August 1942, completed wireless operator/air gunner training in Canada and flew twelve operations with 106 Squadron from Metheringham. Then in March 1945 he went to RAF Warboys, in what is now Cambridgeshire, for a Pathfinder training course. By the time this course ended, in late April 1945, the end of the war in Europe was but a fortnight away and Harry flew no more operations. He received a commission a week after VE Day and was posted to 467 Squadron, which moved from Waddington to (surprise!) Metheringham at around the same time. There Harry took part in the training for Tiger Force, the planned bomber offensive against Japan. Then the atomic bombs, as we now know, removed the requirement for that, and 467 Squadron disbanded at Metheringham at the end of September 1945. Shortly thereafter Harry returned to Australia and following discharge studied Physics at Sydney University under the Commonwealth Reconstruction Training Scheme and worked as a research physicist in atmospherics and minerals. Though he told his family that “the last time I saw Europe was out of the back of a bomber and I never want to see it again!” he did eventually return, well into his late eighties, to visit his children. For the last few years Harry and I had corresponded occasionally after I posted him a copy of the group photograph of aircrew from Killara in 2013. 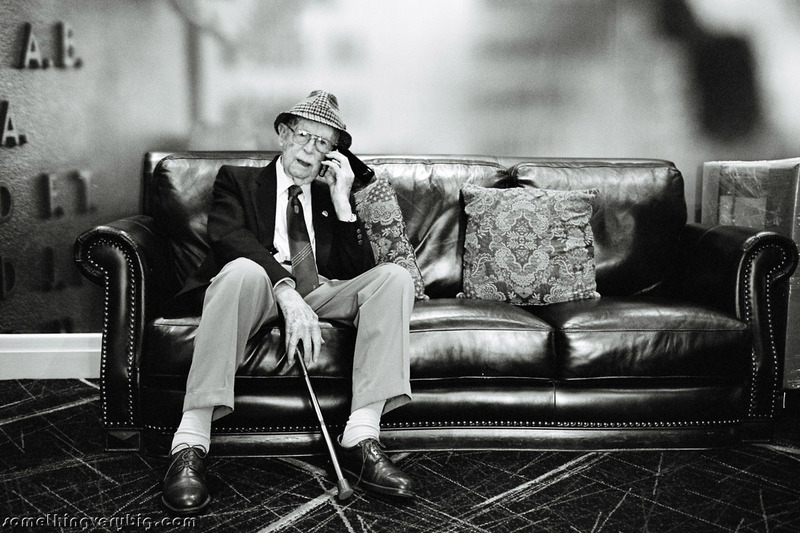 He was one of the rare veterans with an email address (using dictation software rather than a keyboard) and this came in handy when I had technical questions about the role of wireless operator. There were many different types of radios in Lancasters and Harry was a great help in sorting out their various roles. One of his emails mentioned using one of them to get a fix from “0512 East and 56 North when we were shot up over Hampden” (I suspect that was a dictation error from the software and it should have read Hamburg). My calculations place that position over the North Sea, rather closer to Denmark than to England. To my eternal regret I never got around to asking Harry to tell me more about that particular story. Harry had broken his hip in a fall about a year ago and complications arising out of that had meant that he was in various hospitals and nursing homes more or less ever since. 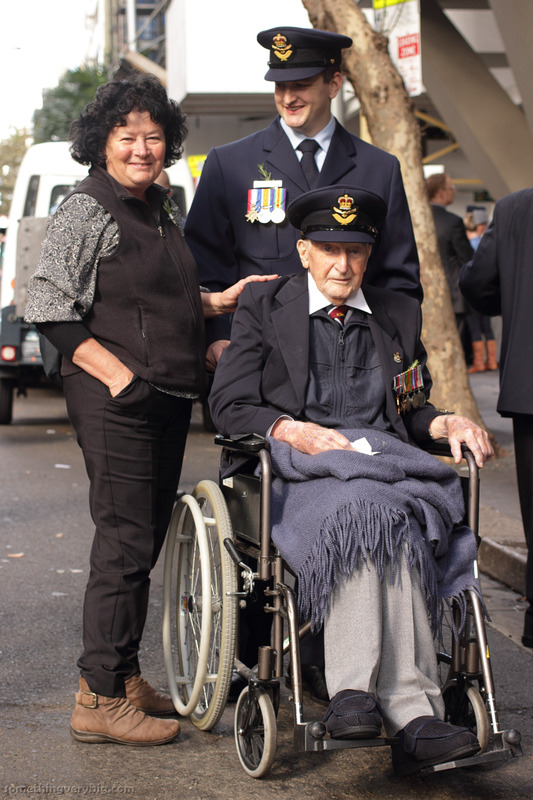 We didn’t see him at the Ladies’ Day lunch last November, but he was determined to come to Anzac Day this year, where his grandson Geordie, who is now a member of the Royal Australian Air Force himself, pushed his wheelchair during the march. A little over two weeks later Harry passed away. 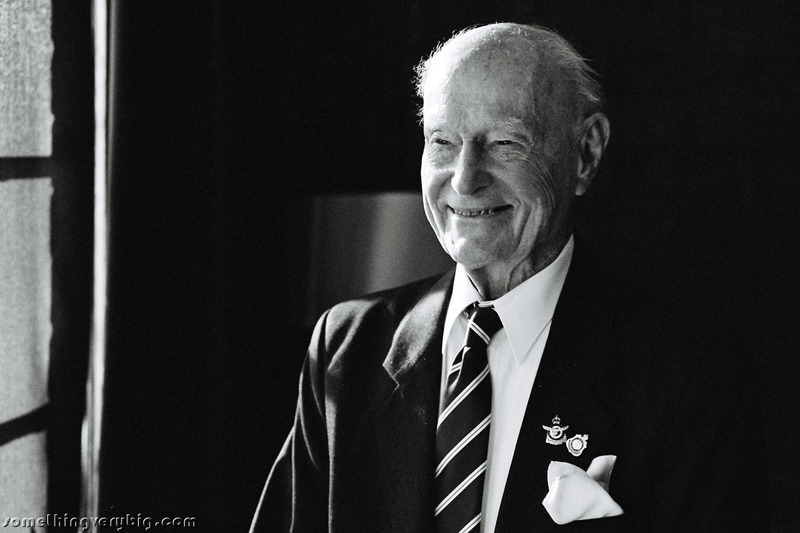 He was the last remaining member of both his 106 Squadron and his 467 Squadron crews. Thanks to Nancy (Harry’s daughter) and Geordie (his grandson) Jacobs for their help with supplying details and the wartime images in this post. Servicemen of all hues have long carried identification tags into battle. Frequently, when soldiers are killed the tags of fibreboard or tin are all that is left to identify the bodies of their owners. But just as frequently, even the tags themselves are missing or destroyed, making the task of identifying the casualty that much harder. Perhaps in anticipation of this – but probably more likely as a good luck charm – it has not been unknown for servicemen to wear their own, private ‘identity’ tags. And not uncommonly, it has indeed been these unofficial trinkets which proved crucial in identifying a dead soldier. Such was the case when WWI infantryman Private Richard John Moffat, service number 2698, from Carlton in Melbourne, was killed in France in August 1918. On exhumation of the battlefield grave some years later, Moffat’s official identity tags were missing – but on the body was a small piece of curved brass, crudely cut into the shape of Australia and engraved with his name. He was identified on the basis of this piece of personal property. His file at the National Archives of Australia notes personal effects connected with Moffat. All it says is “DISC”. Usually personal effects like these would be returned to the family. But, as related by reporter Bridie Smith in an article published in October last year in The Age newspaper, instead of being forwarded on to Moffat’s grieving mother, for unknown reasons the disc was included in his official service record. It was still in the folder when, in 1993, the Army transferred its records to the National Archives. And it was still there when Moffat’s niece, Deirdre Meredith, opened the folder in the reading room at the National Archives in 2001. “It was a heart-stopping moment because it was such a personal thing,” Mrs Meredith is quoted as saying. But when the file was returned to the Archive’s storage, the identity disc had to go back too. And so started a two-and-a-half year battle to get it back to the family. The National Archives held the view that the little piece of brass was part of a Commonwealth record, and thus needed to remain under its jurisdiction. But for the Merediths, it was clearly a family heirloom – it had been part of Private Moffat’s personal possessions. Letters were written to the National Archives, Commonwealth Ombudsman, Government Ministers and Members of Parliament. And she wrote to the Australian Army. Expert advice from historians and legal advisors eventually persuaded the Army that the brass plate was, in fact, the property of Private Moffat’s next-of-kin. And so, in September last year, an Army officer flew to Melbourne from Canberra, and returned the little brass identity plate to its rightful owners. “It was like him coming home”, Mrs Meredith said. This story caught my eye because I can remember similar feelings to those experienced by Mrs Meredith when the plate fell out of the file from one of my first visits to the National Archives a few years ago. The file I was looking at was Jack Purcell’s A705 Casualty File. About halfway into the stack of papers, I found a letter from January 1945 signed ‘EF Purcell’. That would be Edward Francis Purcell. One of Jack’s brothers. It’s a very official letter, dealing with important issues like wills and deferred pay. But the signature pulled me up for a moment. It suddenly reminded me that it was written by someone with whom I share a name, and to some extent a family identity. There are other letters from Edward Purcell. All are typed, as is the letter in the NAA file. All are signed with the same almost copperplate hand. And all are written in beautiful, almost painfully polite language. As far as I know just four other letters exist – all in Mollie Smith’s collection – and so because they are so rare I must confess to feeling a little disappointed that I had to give the NAA one back when I returned the file after looking at it. Of course, this is a different scenario to the brass identity plate in Richard Moffat’s service record. Edward’s letter was an official one, written to the Air Force, and so it legitimately forms part of a Commonwealth record. Thus it quite properly stays in the National Archives, ready for anyone else who is interested to read it. NAA: B2455, MOFFAT RICHARD JOHN. The digital copy of this record still contains a scan of the disc.